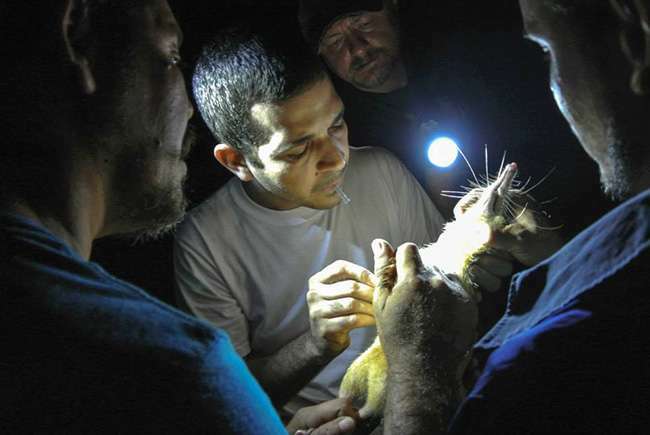 ZooDom veterinarian Adrell Nunez (center) draws blood from a solenodon for DNA samples. Researchers caught the venomous mammal by allowing it to walk across their bodies at night in the forests of the Dominican Republic. Pictured from left to right: Nicolas De J. Corona, Adrell Nunez, Taras K. Oleksyk, and Yimell Corona. Credit: Photo by Taras Oleksyk and Yashira Afanador. "It's just impressive it's survived this long," said co-first author Adam Brandt, a postdoctoral researcher at Illinois. "It survived the asteroid; it survived human colonization and the rats and mice humans brought with them that wiped out the solenodon's closest relatives." An offspring's nuclear DNA is a mixture of genes from each parent while mitochondrial DNA is passed directly from mother to offspring without changes, creating a genetic record that researchers can use to trace back the lineage of organisms. Brandt and co-first author Kirill Grigorev, a bioinformatician at the Caribbean Genome Center, analyzed the samples using two different methods to determine the sequence of nucleotides (building blocks that make up DNA) of the solendon's mitochondrial genome. Independently, the two methods produced the exact same results. "Whether they got on the island when the West Indies ran into Mexico 75 million years ago, or whether they floated over on driftwood or whatever else much later is not very clear," said lead researcher Alfred Roca, a professor of animal sciences and member of the Carl R. Woese Institute for Genomic Biology. What they do know is that any close ancestors are long gone, and today's solenodons are the only remnant of a very ancient group of mammals. While the solenodon is venomous and resembles a "giant rat with Freddy Krueger claws" (according to Roca), it evolved in the absence of carnivores. Today, it is threatened by cats and dogs introduced by humans as well as habitat loss. Can someone please tell me, did they grab these venomous animals with their hands as the creatures walked across them? QED: human disturbance to the ecosystem is more impacting that the asteroid that killed the dinosaurs. Too bad the nascent "walk softly" mentality of the '60s has been replaced with chest thumping, ignorant trolls, "living large". Vermin is as vermin does.